Dr. Marcus was a guest speaker for EDSawareness.com’s educational series, sponsored by www.bodysupportstore.com. His topic was Ehlers-Danlos Syndrome and Pain. CLICK HERE to view the webinar. Are you very flexible and at the same time experience stiffness and pain in different areas of your body? You may have a genetic disorder called Ehlers-Danlos syndrome (EDS). Ehlers-Danlos syndrome is a group of disorders caused by problems in collagen. Collagen is an important part of connective tissue, the structure in our body that holds the various tissues together. Since collagen helps hold joints together, faulty collagen production can result in joints that are too loose. This flexibility in joints may be useful when you are young. Many EDS patients have excelled in sports and dancing because of their flexibility. As you get older, joints that are too flexible can begin to cause problems by popping out of their socket causing dislocations. Minor instability of the joint can result in sprained ligaments and strains of muscles. In the new classification system created in May 2017, there are 13 types of EDS. EDS can also affect other organs such as heart, blood vessels, lungs, and the G.I. tract, resulting in fragile and stretchy skin, fragile blood vessels, gastro-intestinal problems, headaches, and TMJ pain. We are able to find specific genes that cause EDS for the more unusual presentations, but we have not yet found a genetic marker for hypermobile EDS (hEDS), the most common subtype. The diagnosis is made clinically. Because 50% of patients with hEDS have inherited the condition from one or both parents, it is possible to find a history of relatives with overly flexible joints and associated problems. The other 50% are from spontaneous gene mutations and therefore there may be no suggestive family history. The physical examination that is typically done involves documenting excessive flexibility in various parts of the body. Criteria I is a determination of hypermobility, which is done through the Beighton Scale. If your arms and/or legs extend to over 180 degrees, if your thumb can be pulled back and touch your inner wrist, if your finger can bend back over 90 degrees, and if you can bend over and put your palms on the floor, you have symptoms of joint hypermobility. Each of these items count as one point (each arm or leg would count as one point), and if you have 5 or more points (maximum possible is 9 points), then you would meet the first criteria. Rombaut, et al. (2011). Medication, Surgery, and Physiotherapy Among Patients With the Hypermobility Type of Ehler-Danlos Syndrome. Arch Phys Med Rehabil, 92(7): 1106-12. Rombaut, et al. (2010). Musculoskeletal complaints, physical activity and health-related quality of life among patients with the Ehlers-Danlos syndrome hypermobility type. Disabil Rehabil, 32(16): 1339-45. Rombaut, L., et al. (2010). Musculoskeletal complaints, physical activity and health-related quality of life among patients with the Ehlers–Danlos syndrome hypermobility type. Disability & Rehabilitation, 32(16): p. 1339-1345. If you meet the first criteria, but not the other criteria, there is a possibility of having joint hypermobility spectrum disorder. G-HSD is generalized hypermobility spectrum disorder, which affects several joints throughout the body. P-HSD is peripheral hypermobility spectrum disorder, which affects only the joints in the arms/hands or legs/feet. L-HSD is localized hypermobility spectrum disorder, which only affects single joints or a localized group of joints. H-HSD is historical hypermobility spectrum disorder, which means having a self-reported, or historical, symptoms related to HSD. All of these HSD classifications must have musculoskeletal symptoms present. You may have been diagnosed and treated for other pain producing conditions. Some of my patients have had joint replacement surgery for unstable joints, spine operations for herniated discs, radiofrequency ablations, and nerve blocks for pain that was thought to be originating in the joints or the spine. 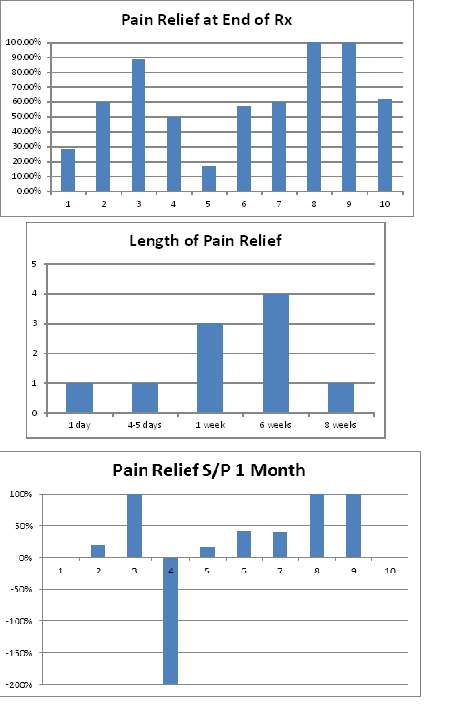 These patients have gone to many doctors and have not been able to receive a diagnosis and treatment plan that was helpful in addressing their diffuse pain and stiffness. You may even have had the experience of telling your doctor that you were stiff and the doctor might answer that you are one of the most flexible people they had ever examined so how could you be stiff? Through observing our patients with pain and hypermobility, we believe that the unstable joints have resulted in tightness in the muscle surrounding the joint. The muscles do this so that the joint can become more stable. The problem is that a stiffened muscle can squeeze its own blood supply, which reduces the oxygen in the muscle. Diminished oxygen causes pain when the muscle is moved. Relieving the stiffness results in more blood flow. In patients who have loose joints but do not dislocate their joints, treatment of the painful muscles may include the use of our injection protocol (see section Muscle/Tendon Injections in “Treatments”) or a powerful (25 watt) laser, which may reduce or eliminate your stiffness and pain and dramatically improve your function. If you have joint dislocations, however, eliminating the stiffness in your muscles completely may destabilize your joints, causing further dislocations and additional pain. In such situations, we have still been able to reduce pain for significant periods of time with a laser. 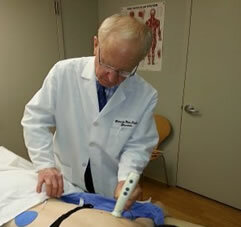 Many patients have had long-standing problems in functioning because of their diffuse pain. Exercises have been very difficult. Physical therapy has often resulted in increased pain. We studied 10 patients with EDS Type III using our laser. We are continuing to do research to determine what would be the most effective comprehensive program that could be tailored to the needs of each EDS patient. We have observed that most EDS patients like to stretch. This is not a good idea even though it feels good. Limbering movement in the range of comfort without stretching is preferable. Stretching muscles and tendons that are already too stretchy doesn’t produce ongoing relief. Exercises to strengthen the muscles around loose joints should be done without straining the muscles being exercised. We suggest low weight, minimal repetitions, no repeat sets, with a circuit-going from muscle to muscle and then back to where you started to do it again. Many patients with EDS may experience pain to every day stimuli, such as pressure or touch. This may be the result of a process called central sensitization (CS). 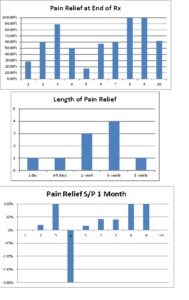 We have been able to decrease CS by (1) successfully eliminating the pain in the muscles with our injections or laser treatments; (2) use of a supplement that occurs naturally in our bodies, palmitoylethanolamide; (3) use of very low doses of naltrexone. All of the medications used for chronic pain problems, including opioids, anti-seizure, anti-depressant medications, and muscle relaxants may all be useful. However, they all have side effects and if you are not getting a clear benefit from a medication you are taking, you may feel better after it is stopped.